This page serves as an introduction to keno gambling strategy, but if you’re looking for a winning system, you’ll be disappointed. The shortest possible article someone could write about keno strategy would consist of just a couple of sentences about how keno is a casino game with a house edge that can’t be overcome. I’d like to go into a little more detail on the subject here, just to make sure the readers of this site really understand keno. When it comes to a keno gambling strategy, you should know there isn’t one. 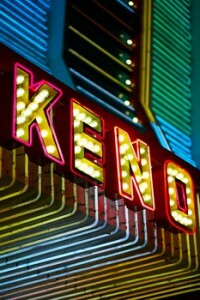 Keno is a numbers game, similar to the lottery, where you simply play and hope the odds are in your favor. There are no guaranteed decisions that you can make to ensure you win. If you enjoy gambling and want to play something simple that can have a nice return, then keno is a game for you. The payouts and odds are better than a state lottery, so if you want to take a chance on a game, keno is your best bet. The Best Strategy For Keno? If you have heard of a keno strategy or betting system that is supposed to be beneficial, be advised that it won’t work. Using any supposed betting system or keno strategy will only get you into trouble. You will lose even more money than you bargained for and perhaps at a much faster rate. The smart strategy is to simply learn how to play keno and to enjoy the game. Keno gambling is supposed to be fun and you can easily enjoy time playing the game if you look at it as simply a way to spend your time. Just spend your time wisely, instead of focusing on trying to use strategies or gambling guides for keno that just won’t work. Keno is a numbers game that can easily be compared to the lottery. You are to guess numbers and hope that you made the right picks when the drawing takes place. During the game, you are provided a keno card with numbers listed from 1 to 80. You are then to choose how many numbers you will wager on. The more keno numbers you choose and get right, the more money you will win. The game is easy to play and used to be a favorite at casinos in Las Vegas. Now it can be hard to find a game and when a player does find one, they usually have to learn how to play keno in Vegas to get started. Many players have never tried the game and may be unsure how to play. It is truly simple and can be a nice way to spend a little time and hopefully see a nice return. Keno’s just a game where you guess numbers, just like the lottery. It can be played online as well as within gaming venues.During the live version, players will choose one to 20 numbers on a card that has numbers 1 to 80 listed. The numbers are arranged on the card in eight rows with ten numbers in each row. The bet usually starts at a minimum of $1. The more numbers you get right when you bet, the bigger your payoff. Of course, the more numbers you bet, the less likely you are to a see a win. And the odds against you get astronomical pretty quickly. Once the betting is completed, the drawing will take place. A total of 20 numbers will be drawn. Winning tickets will be those who were able to match some of the 20 drawn numbers. Depending on where you play the game, the keno payout chart will vary. In 2001, Michael Shackleford did a survey of the payback percentages for various keno games in various casinos. The payback percentages ranged from as low as 65% to almost 80%. This means that the house edge on a keno bet is between 20% and 35%. That’s an astronomical number when you compare it with the 0.5% house edge on a blackjack or video poker bet. Let’s say, for example, a player completed a four-spot ticket with a $1 wager. If two numbers are hit, then $1 might be won, while three numbers would pay $5 and four numbers matched would pay $120. However, another casino might pay differently. It is smart to learn more about the paytable before playing just to see how much you can win based on how many numbers you play. In online keno gameplay, the way to play is the same, except the card will be a virtual one. The process of playing is the same and of course, the more numbers you match, the better the payout will be! How Do You Play Keno and Win? Learning how to win keno is pretty much impossible. There is no strategy or sure-fire guarantee that your decision-making will guarantee a win. You’ll see various websites hawking information products that tell you how to win at keno. They’re all scams. The people who wrote these websites or these information products might believe what they’ve written, but deluding yourself is just as dishonest as deluding someone else, so I have little respect for people selling “how to win at keno” systems. Basically, you want to play at a casino or online gaming site that has good odds on the player’s side and a nice payout chart. Play more numbers on each drawing to have a better chance of winning a payout. For smart gaming, be sure to have a budget and stick to it. By knowing how much you can spend, and choosing as many numbers as you can per drawing, you have a better chance of winning. If you want to play keno, go for it. But don’t be stupid about it. Understand that it’s a game with a huge negative expectation, and get ready to lose quickly and often because of the high house edge. All that being said, you’re still way better off playing keno than you are playing any state lottery. What Kinds of Odds Do Keno Games Offer? Nationwide, playing the lottery, you can expect to see a 50% payback percentage on your lottery play. That makes the lottery one of the worst possible bets you can make, mathematically. Even really lousy slot machines have an expected payback percentage of 75%, and many of them offer even higher potential returns. The reason that lottery odds keep getting brought up in this article about keno strategy is that it is essentially a lottery game that’s run by the casino. You don’t have to wait until a certain day of the week to get the results of the drawing when you play keno, either. The results are being posted for various keno games almost constantly. If you want detailed odds for various keno possibilities, check out the keno calculators over at Shackleford’s site. You can input various situations, and his calculator will spit out what kind of payback percentage and what kinds of odds you can expect on a keno bet. In the game, there are specific keno odds and payouts depending on where you are playing the game. At an online casino, you might find better odds than in land-based gameplay and vice versa. When considering playing a keno game, look for information on the payouts chart. This will help you to see just how much you will earn based on how many numbers you wager on and how many you are able to match during a keno draw. A keno payouts chart will include the payout for each set of matches you make. It will state how much you will earn when one number is matched during the drawing, two numbers matched, three numbers matched and so on. With the chart, you are able to see how much you can earn by matching a specific amount of numbers. The more numbers you play and match, the higher the payout will be! A keno odds calculator can be used to input information regarding a keno game. The information revealed can show you the probability of winning based on certain numbers played or matched, based on the type of calculator you use. Such calculators can easily be found online. With the help of a keno odds calculator, you can decide how many numbers you want to wager on and hopefully, the odds will be in your favor. That’s up to you. If you enjoy playing the lottery, then playing keno will probably also be an enjoyable activity for you. And honestly, keno offers better odds and payouts than the lottery, so if you have to choose between keno and the state lottery, I say go for keno every time. Besides that, I’m opposed to state-run lotteries on principle. I don’t think it’s in the best interest of the citizenry to have the government involved in the administration and management of a casino gambling business of any kind. And that’s exactly what a state lottery is – a state-run gambling business. The government is supposed to protect consumers from unfair and unethical gaming practices. It’s hard for them to do so if they’re actually managing the casinos themselves. Anyway, I digress. Should you play keno? If you think it’s fun, sure, go for it. If you think some kind of keno strategy or betting system will help you beat the odds, then I’d suggest you avoid gambling altogether. The casinos will take away enough of your money if you’re an educated gambler. If you’ve fallen for some malarkey about a betting system for keno that will help you win more often, then you’ll lose even more money to the casino, and you’ll lose it even faster. Each game offers players a new way to enjoy keno, with certain payout percentages and odds of winning. If you like traditional keno, give the other variants a try to see if you might find a new favorite. Keno is a numbers game. Simply pick one to 20 numbers, placing your wager on these numbers, and see if the drawing results in a win! Winning at keno involves choosing the right numbers. How do you play keno and win? Play 1 to 20 numbers and hope that your picks are drawn, instantly winning a prize based on the number of matches you earn during the drawing. Playing keno online is simple. Such sites as BetOnline offer the game of keno in several formats. The basis of the game is the same. You are provided a card online and must choose your numbers. Once the wager is placed and the numbers drawn, wait and see if you earn any matches. The more matches you earn, the more cash you will see added to your online casino account. How much money can you win in Keno? The amount of money you can earn playing keno varies. For the most part, you can win a few bucks in live gameplay if you place the lowest wager. When you begin to gamble with more money and match several numbers during a drawing, the possibility to win 4, 5 and 6 figure paydays begin to emerge. The prize money essentially will depend on where you play the game.